Thryptomene saxicola is one of a number of Thryptomene species, however it is only found in S.E. Western Australia. Sometimes called the ‘Rock Thryptomene’ this species has a number of cultivars that are popular in cultivation. Most are small spreading shrubs that will reach around 1m in height. The foliage is slightly aromatic, however it is the flowers that are the main attraction. Widely grown as a cut flower, and used for backing in flower arrangements, although the main flowering season is spring it does in fact have some flowers for nearly all of the year. 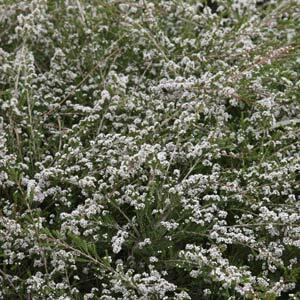 Pictured we have Thryptomene saxicola ‘Supernova’, masses of white flowers. The foliage is dense and in the garden puts on an excellent display when in full flower. One interesting named variety is T. saxicola ‘F.C. Payne’. Pink flowers and fast growing. A well drained soil and a sunny aspects essential, little fertiliser is required. Plants take well to pruning. Propagation is often by cuttings rather than seeds and modern hormone powders have proved to be successful. Prune lightly and regularly immediately after flowering to maintain a good bushy habit. Botanical Name – Thryptomene saxicola. Common Name – Rock Thryptomene. Height – Variable, from .5m to 1.5m depending on conditions. Spread – Around 1m to 1.5 metres. Flowers – Vary in colour from white through to pinks. 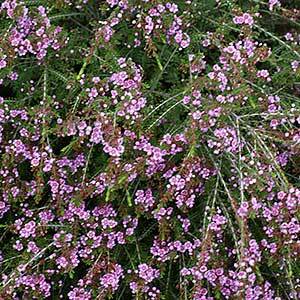 Flowering time – Main flush of flowers is in winter, spot flowers through the year. Fertiliser – Low phosphate native plant fertiliser in spring.